Forest stand dynamics models simulate the growth of trees in stands; based on field measurements and system knowledge, they provide a relatively precise representation of forest growth and are well adapted for forest management purposes. Architectural models describe the structure of plants according to ontogenetic development processes; as a support of biomass production and partitioning at organ scale, they simulate individual tree development. The aim of this study was to link a stand dynamics model and an architectural model to simulate stand dynamics, in which the ecological or silvicultural modelling from the stand model and the architecture representation could be integrated, to provide individual tree details at the stand level. Stand-level simulations of Austrian black pine dynamics provided global results on tree growth from the empirical forest growth model PNN, and branching details for individual trees were provided by the functional–structural plant model (FSPM) GreenLab. Individual tree dynamics were computed, and the simulated trees were integrated at the stand level for visualizing two different management scenarios. By combining a stand dynamics model adapted to forest management with an FSPM with detailed tree architecture, it is possible to simulate individual tree structure with consistent dimensions, adapted to ecological and silvicultural modelling for decision support in forest management. This paper was part of the PhD project of the first author, which was funded by the China Scholarship Council with the support of CIRAD. 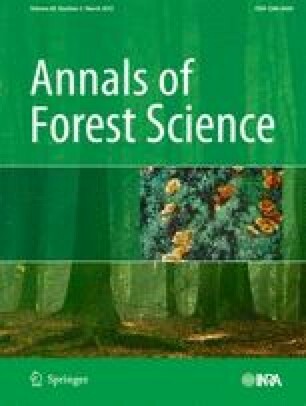 The authors are greatly indebted to research technicians of INRA-URFM, non-permanent staff and students, involved in establishing and maintaining plots, measuring surveyed trees, performing stem and branch analyses in the field and hence gathering the data necessary for calibrating the EFM. Thanks are also due to the French National Forest Service (ONF) for allowing us to establish experimental plots in managed stands and to fell trees for stem and branching analyses, to Sébastien Griffon and François de Coligny for their contribution to visualization software development and to two anonymous reviewers for their constructive comments.